Niki Alling's Blog: Proud Daughter! 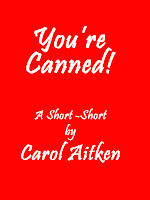 As I've been working on writing for the Kindle, my Mother, Carol Aitken, has also been having fun writing too. She has finished a short story and published it! It's a sweet story about a little girl in the 1940's who observes her Mother, Grandmother and Aunts as they toil at a produce factory. A poignant glimpse of what life was like for women back then and their strong family ties. Soon to come - Another up and coming writer in the family, my brother - William G. Aitken. A fabulous young author, who writes incredible stories of paranormal, horror, thriller, mystery and more!